Dave & Buster’s, the Texas-based chain of restaurant and entertaiment facilities, opened a facility in Braintree in 2011. Dave & Buster’s will be bringing one of its giant dining and entertainment establishments to a site off Route 128 after the Woburn City Council approved plans from the Texas chain. By a 7-2 vote, the council last Tuesday granted the special permits and site plan approval to construct a 47,350-square-foot facility at 275 Mishawum Road. The approval, which came with 29 conditions covering traffic, public safety, and other issues, is subject to a 20-day appeal period. The venue will include a 420-seat restaurant, an arcade with 200 video machines, a bar, a sports bar, a function room, and a board room for corporate meetings and social and community events. The council approval culminated months of review and discussion of the project. The Planning Board and the council’s special permits committee both recommended approval subject to conditions that were the basis of those set by the council. “I felt that through the process, the special permits committee and the petitioner worked out a very good compromise to any issues that were pending and they came to a consensus that was palatable to me,” said council president Paul J. Denaro. Denaro said he also thought the project would pose less impact on public safety than the dense residential development that might have been built had Dave & Buster’s not been approved, noting that a string of such housing developments in recent years is “really taxing our ability” to meet public safety demands. The Woburn location would be the second in Massachusetts for Dave & Buster’s, which opened a 33,000-square-foot facility off Route 128 in Braintree in late 2011. The chain launched its bid in Woburn after its plan for a 43,000-square-foot building on the Middlesex Turnpike in Burlington was rejected in 2011 by that town’s Planning Board. The Woburn proposal did not encounter the same level of controversy, but there was some opposition. He said he also objects to the plan by Dave & Buster’s to make use of 104 parking spaces at the adjacent Northern Bank lot during off hours to meet part of its parking requirement, contending that more spaces should be provided on site. The plan calls for 386 on-site spaces, including 282 in a surface lot and 106 in a garage under the building. “I’ve heard from a good many neighbors who were against it. There were other neighbors that weren’t so concerned, but I heard from a lot of people concerned about the impact,” said Anderson. He said the project also would offer some benefits, citing the planned traffic improvements. Founded in 1982, Dave & Buster’s operates 59 sites with more than $525 million in annual sales, according to the firm’s website. It said its sites on average have more than 500,000 annual visits. The 4.84-acre Woburn property is part of the former site of a Massport Logan Express bus terminal and parking lot. In 2007, Northern was permitted to erect its headquarters and 210 apartments on the site. The bank built the headquarters, but never went forward with the housing. Dave & Buster’s will be built on the land that was set aside for the housing. 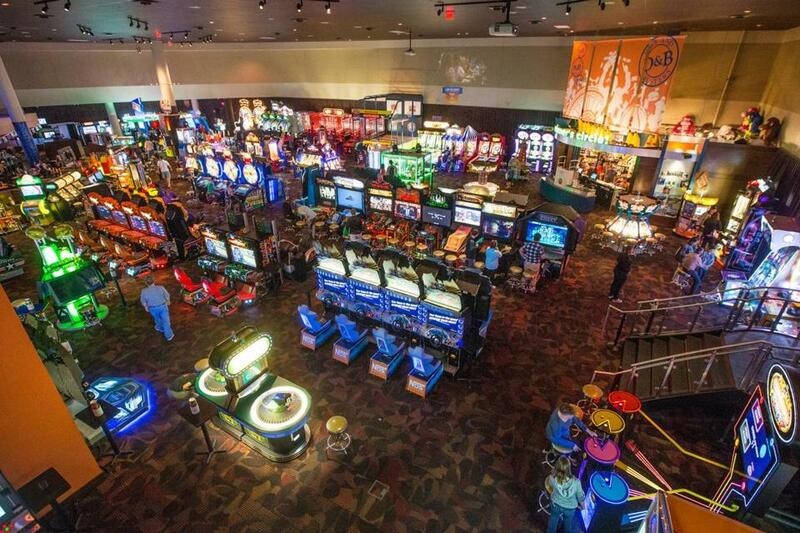 Dave & Buster’s previously secured licenses to serve food and alcohol — and to operate the video machine parlor — from the city’s Licensing Commission. The project is expected to provide the city with an estimated $243,090 annually in property taxes, along with $25,000 in local meals taxes and $20,000 in fees from the video machine operation, according to Tarby. He said the company has said it employs 146 people at its Braintree site and expects a similar number of jobs at the Woburn location. The conditions agreed to include upgrades to traffic signals at three nearby intersections to improve traffic flow, and replacement of the water line and repaving on Mishawum Road. Other requirements include that the chain provide police details on Thursday through Sunday nights, and that it hire a crowd manager to ensure the establishment is continually meeting all fire codes. The conditions also restrict the hours of operation to 11 a.m. to 1 a.m., though Tarby said the company plans to close at midnight on Sundays through Thursdays except in the case of special events. Tarby said construction is expected to start either by the end of this year or in the spring, depending on weather conditions.